Have you ever walked through the jewelry section at a craft stall, a flea market or even a high-end department store and thought to yourself, “I bet I could make that”? Well, guess what… you can. Do-It-Yourself jewelry is becoming more and more popular, thanks in part to inspiring craft-filled websites like Pinterest and Etsy (the latter website even offers you the opportunity to sell your handmade wares online and earn some extra money). But don’t just take our word for it. 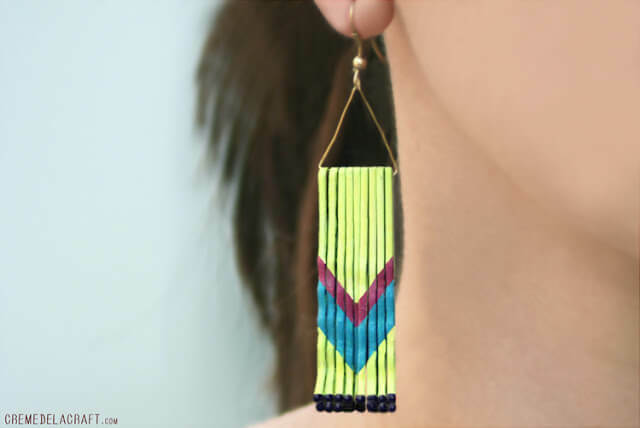 We show you exactly what you need to sport your crafty prowess and create your very own DIY earrings. Hoops are probably the simplest of all DIY earrings to make and a good place to start if you’re a beginner. They are versatile in shape and design too – add your own selection of different beads in all sorts of colors, materials and densities to create accessories that are truly your own. We show you how to create three standout designs using the same basic tools. Using the wire clippers, cut two strips of wire, each of them approximately 2.5 inches in length (63.5 mm). The length of the wire will determine how big your hoop will be. Find a small bottle and mold the wire around it to form a circular shape. Aim for a U-shape as you gently bend the wire. Get as creative as you’d like here, sliding on whichever beads tickle your fancy. Depending on the beads you’ve selected, you can add as many or as few beads as you’d like. Using the fine tips of the jewelry pliers, carefully curl the ends of both wire tips inwardly, forming small hoops. Push both ends of the wire together so that the loops rest on top of each other. Use a jump ring here to attach the loops together. Insert a hook earring into the jump ring and voilà! Just like with the round hoops, cut two strips of wire but this time, aim for longer pieces – each one approximately 3 inches (76 mm) in length. Press down the middle of the wire using one finger, bending it to form a fish-like effect. Allow the ends to cross. Slip the beads onto the wire one by one. Using the jewelry pliers, twist one piece of the wire around the other three times, approximately ¼ inch away from the wire’s tip. Take this wire tail and curl it down into a loop. Finish by fastening an earring hook to this loop and there you’ve got your first oval hoop earring. Remember we said hoop earrings were the easiest to make? We stand corrected: these earrings may just be the simplest, both in the tools you need and the level of skill required. All you basically need are two eyepin hooks, your trusty jewelry pliers and a few beads! Slip your favorite combination of beads onto a straight eyepin. Using your jewelry pliers, bend the tip of the eyepin into a hook. You could add a French earring hook to the tip but that’s totally up to you. The eyepin hook on its own does the job of an earring hook just fine. Maybe you’ve been invited to a really fancy event – a formal, black tie wedding maybe? Or perhaps you’d like to give your best girlfriend a thoughtful, personalized gift for her birthday. These dainty lace appliqué earrings are a perfect choice. As delicate as they are striking, these earrings have a pretty vintage effect to them and are as elegant as they are trendy. They look so professionally made, you may even find yourself taking orders from your nearest and dearest to make some for them too! 1. On a sheet of wax paper, lay out your two lace appliqués and paint a good layer of fabric stiffener all over each of them, both the front and back. Allow them to air dry completely for about an hour. This process is really important as the fabric stiffener will prevent the lace fabric from fraying or becoming discolored as you wear them. 2. The next step involves tweaking the appliqués ever so slightly so that you create a space for the earring hook to fit into. This, of course, depends on the type of appliqué pattern you’ve chosen. The key here is to snip very carefully and not do any damage to the appliqué. Also, remember to make sure that both appliqués look the same when you’re done. 3. Using your jewelry pliers (the regular, straight-tipped ones you’ve used earlier will work just fine), gently bend open one of the jump rings and fit it into a gap at the top of the appliqué. Close the gap in the jump ring, before adding in a second jump ring to the first, so creating a small chain link. 4. Your French earring hook should now slot perfectly into the jump ring. Be sure to close the fastening tightly but still gently. And there you have your very elegant (and very easy to make) lace appliqué earrings. No matter what length of hair you have, there is one thing all women usually have an oversupply of – and that’s bobby pins. And with good reason. They’re really handy in a pinch – from pinning your hair back at the gym to creating feminine schoolgirl braids, the basic bobby pin is every girl’s go-to hair accessory. But did you know they make funky earrings too? Best of all, you can customize them so that they’re uniquely yours, and stylish enough to be bang on trend too! Lay out your sheet of cardboard and fasten all of the bobby pins onto it, leaving a small space in between each of them. As a primer layer, paint one coat of clear nail polish onto all of the bobby pins. Let this layer dry completely before painting the other side too. Next, apply a base color of your choice to both sides – in the example here, a luminous neon green is the base. Remember to do this on both sides of the bobby pins. Using your pencil, lightly draw your design onto the pins. Now comes the really fine work. Using your small brush, carefully color in your design using the nail polish. Allow the polish to set and then apply a final layer of clear polish to give a glossy effect. Next, bend the thin wires into triangle shapes. Twist the very ends so that they meet and close. Once your bobby pins are totally dry, carefully remove them from the cardboard and slot them evenly onto the wire triangles. Attach both earring hooks and you’ve got your own bobby pin earrings! Triangles are a huge trend right now – we’re seeing them everywhere from Aztec prints on clothing all the way to fashion jewelry. Funky leather triangle earrings are a great way to incorporate the latest style trend into your wardrobe without it costing you a fortune. The great part about it is that they are so cheap and easy to make, you can experiment with different colors and patterns – whatever your heart desires! Lay out the sheet of scrap leather on a flat surface. On the backside of the leather strip, measure out triangles one inch in length. Using your craft knife, cut out individual triangles. Paint over each triangle using the fabric paint, applying about two to three layers to each triangle. Use your all-purpose glue to stick three triangles together, as seen in picture 5 here. Allow them to dry thoroughly. You could either use earring posts for your earrings but a more durable method would be to use your utility knife to poke a little hole into the tops of each triangle shape. Then slot through a jump ring and earring hook into each of your triangle creations and there you have it – your very own leather triangle earrings.